By the mercy of God the new Church Year began a few days ago and today we celebrate the first feast of the annual liturgical cycle - the Nativity of the Most Holy Mother of God. By the mercy of God the new Church Year began a few days ago and today we celebrate the first feast of the annual liturgical cycle – the Nativity of the Most Holy Mother of God. In order to understand the meaning of this feast and the other feasts of the Church, we must first remember that Church life is a mystery, beyond the grasp of those who are outside the Church. It is after all not by chance that the most important things in the life of Holy Church, the central points through which we become partakers of the grace of God, are the Sacraments. We ourselves with our created minds are unable to grasp this mystery of the Church. But the Lord in His mercy gradually reveals it to those who live in the Sacraments, who fall down before this source of grace and drink of its living water. There are many mysteries in Church life, but one of them is constantly revealed to the faithful. We enter into communion with it not only when we receive the grace-bearing gifts through the Sacraments, but whenever we are in church and take part in the services. Moreover, for many of us faithful, this mystery continues to remain concealed. In order to actually touch it, we must not only be simple listeners and observers of what happens in church, but must enter into the experience of those who created the services and sealed this in the prayers and hymns which they wrote, from apostolic times on, through to the martyrs and saints and ending with the ascetics of our own times. Those who created the services, in complete accord with all the fathers and teachers of the Church, tell us that man is made for Eternal Life, that the only genuine element in which his soul can live is eternity. When we bury our departed and pray for the rest of their souls, we ask the Lord to grant them eternal memory. But this prayer can concern us who live on earth too, because we also need the Lord to have us in His Eternal Memory: after all the aim of our life is precisely communion with eternity. Therefore the best and most precious desire of the Church is for eternal memory. But we always forget this. Weighed down beneath the cares of this life and in the shadow of changing circumstances, we forget what we have been created for, we forget about eternity, in which alone lives that which the Lord made – VIRTUE. Everything other than this is rejected and cast into the fire – into outer darkness. It only seems to us that it exists, but in fact, as one holy father says: ‘In the beginning there was no evil, because still now there is none among the saints and for them it does not even exist. In reality, there exists only life in God and the path of acquiring the Kingdom of God within us. The holy fathers tell us that man is made according to the image and likeness of God, that he is the crown of nature, the king of all visible creation and at the same time the sharer in the mysteries of the grace of God. They teach that in his body man is connected to all earthly creation, because the Lord created this body, having taken the dust of the earth (Gen. 2, 7), and that in his soul man is united with the angelic world Above. Man stands on the frontier of two worlds – the earthly and the Heavenly. ‘In his creation – says St Gregory the Theologian – the Word of the Maker creates a living being, in which visible and invisible nature are brought together; He creates, taking a body from the substance which He has already made and putting life into it from Himself, and places on earth another Angel, a worshipper made up of different natures, an observer of visible creation, a possessor of the mystery of invisible, contemplative creation. But man, made in the image of God and placed by the Lord on the frontier of two worlds, did not fulfill his appointed destiny: he sinned, having fallen away from God, and through him the whole visible world, of which he was the crown, began to leave the Lord. Then the Son of God appeared on earth, He Who did away with death by His death and by His Resurrection revealed to us the path to Eternal Life. He granted eternal memory to us too, and not only to us who believe in Him, but also to all visible creation. Therefore our task, cleansing our souls from sin, is also to raise up and make spiritual the material, from which the body is made, having made it an abode worthy for the immortal soul. The holy fathers say that on the day of the final resurrection not only will our souls stand before the Lord, but together with them our risen bodies also. And in this earthly life, in our ascent to God, we can only go the way which the Lord, Who placed us on the frontier of two worlds, has shown us. Only in communion with both these worlds and together with them can we here on earth serve God. Holy Church continuously reminds us of this in Her services. Recently we had the service for the Church New Year. Then we gave praise to the Lord not only on behalf of ourselves, but also on behalf of the whole visible and invisible world, with which we are united in our bodies and our souls. This is clearly expressed in the canon of the day: O Lord, all Thy works, the heavens, the earth, the light and the sea, the waters and all the springs, the sun, the moon and the darkness, the stars, the fire, man and beast, praise Thee together with the angels. He who believes that these words correspond to reality and that in the services we are truly united to both these worlds, understands the greatness of the mystery contained in the Orthodox services. 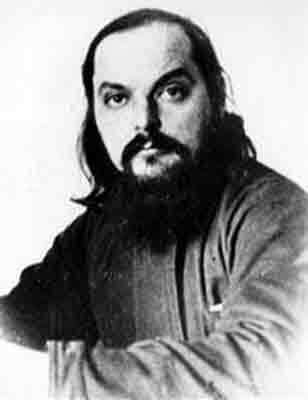 This mystery is not only in the abolition of the frontier between man and all creation – the heavenly and the earthly, of which we are so acutely aware in this temporary world, but is also in the fact that through the services we pass beyond the very frontiers of time of our present nature and enter into the world of eternity. Consequently, there is nothing ephemeral in the services, but everything lives in eternity. Usually we see the meaning of the celebration of this or that event in the life of Jesus Christ or of the Mother of God in that we go to church, listen to the Gospel and the hymns which speak of the events which happened at some point a very long time ago and we recall them. We can also think of today’s feast in this way. Church Tradition tells us that about 2,000 years ago the Most Holy Virgin was born in the Galilean town of Nazareth from her very elderly parents, the righteous Joachim and Anne. 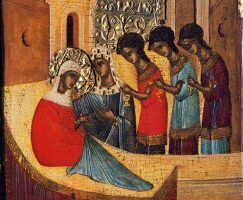 It tells us that through her birth the Virgin Mary freed them from their bonds of barrenness and bestowed great joy on them. Today’s hymns tell us about this and, as it would seem, the whole meaning of the feast can be reduced to simply recalling these events. However, if we turn to the texts of those selfsame hymns and try and enter into the meaning of what their authors intended, then we shall be convinced that such an attitude to the feast is typical only of outward-looking people, who do not understand the mysteries of Church life. In reality the hymns of the feast speak of something quite different. In the stichira at Vespers today: Today the gates of barrenness are opened and the door of the Divine Virgin appears before us…today is the proclamation of the joy of the whole world, today the winds have wafted up, the heralds of salvation, the barrenness of our nature is abolished, and finally: Today barren Anne gives birth to the handmaid of God. What does this today mean? (Today barrenness is abolished, today Anne gives birth to the handmaid of God). Are these only images, poetic expressions, or do these words contain another meaning? If we reason according to the views of the wisdom of this world, then the affirmation of the real meaning of these words appears to be folly. After all, all of this took place at some point a very long time ago. But for those who mind the things of the spirit (Rom. 8, 5), everything that has taken place for us and for our salvation not only happened in time, but also abides in eternity. This is why when we hear now that today the Pure Virgin comes forth from Anne, the gates of eternity open to us. 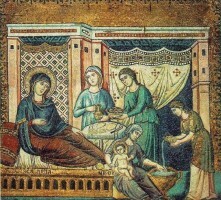 Today’s service tells us that the birth of the Most Holy Virgin was a joy not only for Her parents and kin who lived in Nazareth, but that it also became joy for the whole world, that it freed from barrenness not only the holy and righteous Joachim and Anne, but that in it our nature is also freed from barrenness, and life-bearing fruit is born to the world. The services reveal to us that the Nativity of the Mother of God was significant not only for those who lived in Nazareth at that time, but it also took place for us and for our salvation, that with Her birth today is born a bridge that takes us to eternity. When we glorify the Lord, we end each glorification with the words: now and ever and unto the ages of ages. Holy Church tells us in these words that the services which we are celebrating now are celebrated both eternally and unto the ages of ages, because they are already being celebrated now in eternity and bring us into communion with Eternal Life. The great mystery of the services is contained in this and is revealed to us in Holy Church. If you take away from the services their sacred meaning contained in the words now and ever and unto the ages of ages and which for us contains the source of Eternal Life, you will forever be torn away from that which was and which disappeared into the irretrievable past, for nobody can be present at the birth of his mother or father. But we know that the best of our ascetics, those who created our liturgical hymns and canons, drank from this source of Eternal Life. They learned from experience that the services reveal the knowledge of eternity to us. And for us sinners, the most important thing (and we should always remember this) is to enter into contact with this source of knowledge, revealed to us through the mystery of the services. But for this to happen, while you are still here on earth, accept with faith, reverence and the fear of God everything that you see and hear in church, everything that takes place, that is sung and read at the services. And again today entering into the annual cycle of the services, let us remember WHO we are and WHAT WE ARE CALLED TO. And as we enter into it, the great mystery of eternity will more and more be revealed to us. Holy Church believes that we are not alone in celebrating the services, that the Angelic Hosts and the whole Church in Heaven pray and glorify the Lord together with us. Today the Heavenly Hosts invisibly serve with us – this is what we sing at the Presanctified services during Lent. And not only on these great days, but also on all days of the Church year, at every Liturgy, at the little entrance, the priest prays: Make our entry to be also the entry of the holy angels, who concelebrate with us and glorify Thy goodness. It is precisely from this, from this co-presence and concelebration with us of the angels and saints, who have already attained eternity and live the eternal life in the Lord, that a great yearning for eternity is born in us too. 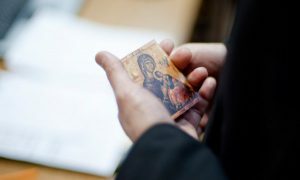 This is why at the Divine Liturgy, once the priest has offered the Lord the service of thanksgiving for all the saints and especially for our Most Holy, Most Pure, Most Blessed and Glorious Sovereign Lady, the Birthgiver of God and Ever-Virgin Mary, he remembers the living and the departed and prays that the Lord may remember them in His Kingdom, that is, that He may grant them communion with His Eternal Memory, which is also the Kingdom of God. From this it should be clear to us that the service which is celebrated here on earth is no other than the gradual unfolding in time of the mysteries of eternity. And for each of us faithful this is the path that takes us to eternal life. This is why the feasts of the Church are not some chance gathering on memorable days, but are shining points of eternity in our ephemeral world and we pass from one to another according to an unchanging spiritual order. These points pass from one to another according to a defined order, they are connected to one another, like rungs on a single ladder of spiritual ascent, so that, standing on one of them, we can already see the light which illuminates us from the next rung. So today, the reading of the canon is accompanied by the singing of the katavasia of the Exaltation of the Cross. Although this would seem not to be connected to today’s feast, this is not in fact the case. It tells us of the unbreakable spiritual link of the Church feasts which follow one another. This is the light of the Exaltation which illuminates us from afar, so that even today we begin to enter into it. The mystery of the services is the greatest of the Church’s mysteries. We ourselves are not able to grasp it all at once. But we know that it was revealed to the great and the greatest of the saints of God. Therefore, entering into their experience through the prayers and hymns in which they sealed it, asking for their help and prayers for us sinners, we too can gradually start to touch this great mystery. And since through this, elements of eternity come to birth and grow in us, we will also relate to our temporary life in another way, differently from now. Then we will understand that it is only a path which takes us from what is below to what is above, from the temporary to the eternal. And then, when we leave this life, perhaps we shall be found worthy of the Eternal Kingdom prepared by the Lord for those who even here on earth started to enter into His Eternal Memory, which is the greatest achievement for man, who is to pass from what is below to what is above.